A friend of mine has a bakery in Wye when she was looking for a name for her venture, she rejected all our fancy suggestions and called it: Wye Bakery. When asked the reasons behind such a plain denomination, she replied "A name should reflect exactly the business". And here we have it. "The Real Greek" is not only a restaurant, in my opinion it is a real Greek experience in hospitality. Here, they managed to transport hellenic atmosphere as well as cuisine. It could be the blue and whitewashed decor filled with light pouring in from the large bay window. But then again many adjacent restaurants have made a effort to place their diners "in situs". The large size tables inviting conviviality help matters. There is no apologies for ordering 2, 3, 4 dishes and share. They will arrive on a strange metal contraption. Portions are generous and reasonably priced, may be this is where it differs from my many experiences in Greece where everything seemed overpriced. Michelle of Greedy Gourmet had organised a get together for Jeanne as in Cook Sister!, Sarah of Maison Cupcake and myself. It is always great to meet up with blogging buddies but I've got to say I was lukewarm at the thought of the food. When ask which kind of food I like, it will never cross my mind to reply Grec food which I often find standard. Having said this, when you will be in Westfield Center in Stratford, The Real Grec is a must-visit. This chain of 6 London restaurants has already carved its reputation in the shopping center, for the right reasons. Christos Karatzenis, head of operation and second generation of restaurateurs made us so welcome that it was difficult to leave. This might have also been due to the fact that after sampling almost every single dish on the menu, we were rather full. Sarah and Michelle describes our meal as an Olympic marathon. We tucked in cold Meze, hot Meze and desserts. Every dish we had was well prepared. Flavours are traditional, take the taramasalata (£4.25) it bares nothing in common with the commercial pink goo. Here, chefs make it with naturally undyed cod roe it is smooth and fresh and....off-white. Hummus (£4.25), is light, with very little of the rich tahini, it tastes different from what we are used to. By the way, hummus is one of the most popular Real Greek cold meze, I hope I am not revealing a secret by saying that the Head of Operation is planning to enlarge the range. One can easily see a hummus card working very well, here. Personally, among the cold meze, I had two favourites. Two dishes I don't remember having had before. Two surprises standing out, not the Greek flat-bread (£2.50) which is delicious, the crudites (£2.25) a necessity to dip which by the way could be complementary, the already named and described above nor the dolmades (£4.25) which I never liked so didn't try but the Htipi (£4.50) and Gigandes Plaki (£4.25). Gigandes Plaki are giant beans slow-cooked in tomato sauce, inspiring,easy to cook at home. We were told that each Greek household and every region had its own variation. He and I may have had it when we worked in Greece but the texture was more like a thick soup. Htipiti is real Greek feta, and we all know how much feta can vary, coarsely chopped with grilled red peppers and red onions, if I can pronounce it, Htipiti will be top choice, next time Greek food is on the menu. When the hot meze appeared, we were already slightly full. At this stage, I have got to tell you that the menu shows the calories intake for every dish with 913 calories Tarama Salata is a winner but at 257kcal Pork Belly should be indulged. can be divided in fish and meat, the meat is mostly minced under various shapes and forms, standard Greek cuisine with generous portions, well cook. Here one dish stands out, the slow roasted Pork Belly (£6.25), cooked like Gyros but without its skin therefore all the fat was crackling and delicious. Don't go away without trying one of their sea-food dish. It is notoriously difficult to cook octopus and Kalamari it could get chewy and greasy, the Real Greek chefs cook this really well, Kalamari with Greek honey and paprika (£6.50) is delighted, Tiger Prawns (£6.50) are juicy and thick. 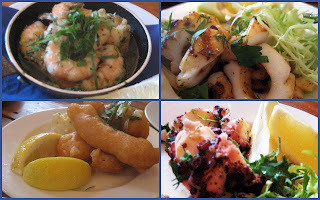 The Grilled Octopus (£7.25) was my overall winner, a simple dish in olive oil, close your eyes and you are by the Aegean sea, frolicking with the gods. When the funny contraption got to our table, it was dark outside and we had little room left, real Greek yoghurt and walnuts with honey (£4.25) was the best dish on the tray. The walnuts were so soft that I had assumed they were chestnuts when you start to mix your nuts up, it's time for coffee. Like everything else the selection is vast, opting for Greek coffee. A engagement party was arriving it was time to say good bye to the staff who looked after us and every single other table, with professionalism and an enthusiasm for the food which was infectious. In brief: Generous portions, overall good value, authentic Greek food, in my opinion some dishes were more flavoursome than others, the slow cooked or the barbecued ones were my favourites. Warm and enthusiastic staff help to complete the experience. 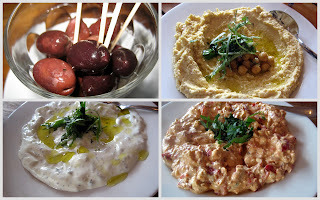 As it's Mezze base, try to go with a party or order 3 to 4 dishes per person, open and light decor. We were guests of The Real Greek. Fantastic meal and great company! I did love our huge table although I noticed as we left that actually it was the only one in the restaurant that size - most were standard size square restaurant tables. To be honest, I wan't that enthusiastic beforehand but I thought I should be open minded... and it worked!